BEIJING, Oct. 16, Chinese President Xi Jinping on Tuesday reiterated China's commitment to free trade and economic globalization while meeting with Stephen Perry, chairman of Britain's 48 Group Club in Beijing. Briefing the guest on the Chinese people's pursuit for its "two centenary goals" as well as China's history, Xi said the great achievement of economic and social development in the past 40 years has strengthened China's determination of reform and opening up. The "two centenary goals" refer to China's aspiration to finish building a moderately prosperous society in all respects by the time the Communist Party of China (CPC) celebrates its centenary in 2021 and turn the People's Republic of China into a modern socialist country that is prosperous, strong, democratic, culturally advanced and harmonious by the time it celebrates its centenary in 2049. "Under the current world circumstances, China is even more determined to support trade liberalization and economic globalization," Xi said. "We advocate that countries should enhance exchanges, cooperation, understanding and mutual trust, and avoid suspicion, prejudice and misunderstanding in international affairs," he said. Xi said China will not seek hegemony even if it grows stronger, but will steadfastly safeguard world peace and uphold the building of a community with a shared future for humanity. Xi hailed the "ice-breaking trip" made by Jack Perry, Stephen Perry's father, together with a group of far-sighted people from the British business community in spite of lots of obstacles in the early 1950s. He said the China-UK friendship has been deeply rooted in the peoples of the two nations today, and it has become a consensus shared by the two governments and peoples to develop the "Golden Era" of bilateral ties. "I'm very glad to see the spirit of the 'ice-breaking trip' is being carried forward from generation to generation," Xi said, referring to the 48 Group Club's continuous enthusiasm for China-UK friendship. Lauding China's tremendous development achievements and the ambitious blueprint made at the 19th National Congress of the CPC, Perry said he is sure that China will achieve its goals. Perry said the 48 Group Club is committed to enhancing the exchanges between China and other countries, and is ready to participate in China's process of development and rejuvenation. Perry spoke highly of the Belt and Road Initiative and the notion of building a community with a shared future for humanity raised by Xi. 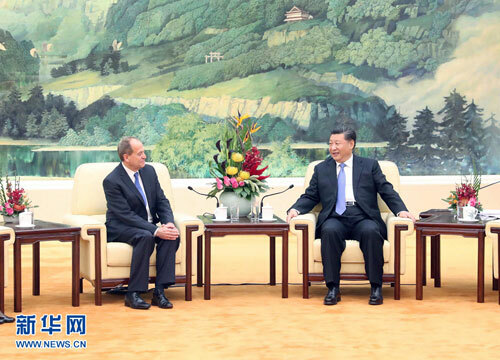 He said the 48 Group Club will continue supporting globalization and an open world economy and promoting the UK-China cooperation within the Belt and Road framework with the spirit of the "ice-breaking trip."